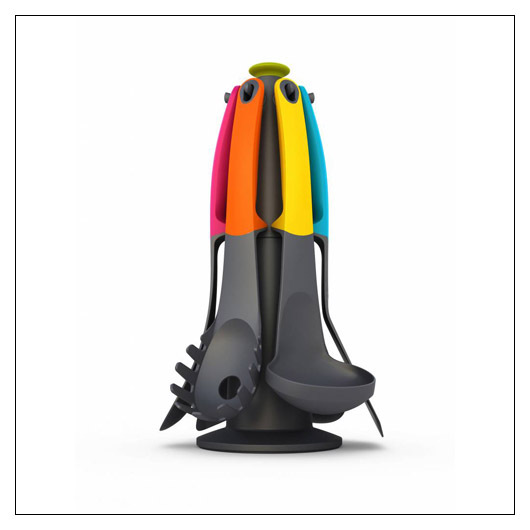 Elevate Carousel Utensils and Stand Set (JJELEVCARO) at Pure Design / Accessories / Kitchen ::: Furniture for the Home, Office, Home Office, and More at Pure Design Online! Now your favorite set of Elevate kitchen utensils are available on a space-saving carousel stand! Get all six innovative Elevate tools PLUS a handy 13" rotating stand. As stylish and functional as ever! Includes: elevated carousel, spaghetti server, solid spoon, slotted spoon, ladle, flexible turner, and slotted turner. 13.75" x 6.75" x 6.5"
This item can only be shipped to the "lower 48" US states.